The Infant of Prague is a prayer ministry. We are the voice and hands of the Infant Jesus. The Guild’s purpose is to bring people closer to the Infant so they will receive His peace and blessing. When a child is baptized, we provide the child with a statue of the Infant along with a pewter Infant medal and a prayer card with the Parent’s Creed. Annually, we arrange with our pastor to have a Sunday Children’s Mass in which their choir provides the music. Each year, we give financial aid in the form of partial tuition to two students in our school. In 2003, in commemoration of the parish Fiftieth Anniversary celebration, our Guild purchased the Papal flag which now flies under the American flag at school. We meet the first Monday of the month in the Parish Center at 1:00pm. We also attend the 8:30am Mass the first Tuesday of the month. 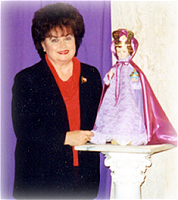 For more information about the Infant of Prague Ministry, please contact Patty Griffin 330-793-4799.